This last week has been soooo busy. The older two have gone back to school, I’m trying to get the younger two back into some sort of routine. Who would have thought it would be so difficult to get them to get dressed & brush their teeth every day, not to mention get something that resembles learning fit in the day! Plus this was my grocery shopping week. Being that I only grocery shop once a month, it’s an all-day affair. In between running around like a chicken with my head cut off, I have gotten quite a bit of knitting done. I FINALLY received the knitting needles I ordered back in FEBRUARY! They were back-ordered through the manufacturer, so not the fault of the yarn store. I will most likely order from them again. They were very good about communicating with me. 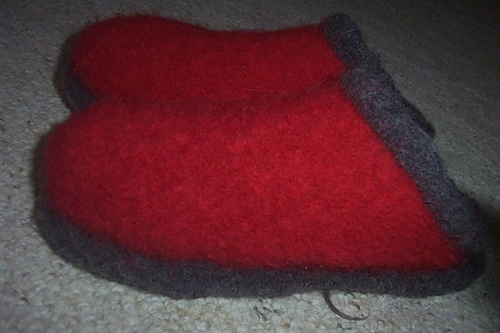 Because I finally got the needles I needed I could cast on for my Felted Clogs. They were such a fast knit. I cast on the first one Saturday afternoon and had them felted by Sunday evening. They are the most comfortable pair of slippers I’ve ever had. I’ve decided I’m going to make a pair for everyone for Christmas. I may even buy the children’s version too, even though I only have one kid who needs that size. Even my 10yo has feet the size of mine! I’ve also been plugging away at a pair of Charade socks for a friend. I’m not liking the pattern much. It’s boring me to tears. As evidenced by the fact that I’m still on sock #1 almost two weeks after casting on. But the result of the pattern is more interesting than plain 2×2 rib. It’s not all because of boredom though. I have cast on the Lace Ribbon Scarf by Veronik Avery and LOVE IT! It’s so hard to put down. It’s not difficult, but I have pay attention to which direction rows I’m on so it keeps my brain busy. Next week will probably prove to be just as busy as this last week was. It’s report time. Homeschoolers NY state we are required to submit quarterly reports. It’s not difficult. Just busywork. I do hate busywork.